Here is the third video in a series of Head to Head Air Pistol Shootouts. In this video place the KWC Model M1911 Tac A1 head to head versus the Cybergun-KWC GSG 92-M92. Both CO2 4.5mm Replica Air Pistols feature full size drop out metal magazines that hold the CO2 and 4.5mm steel BB's. 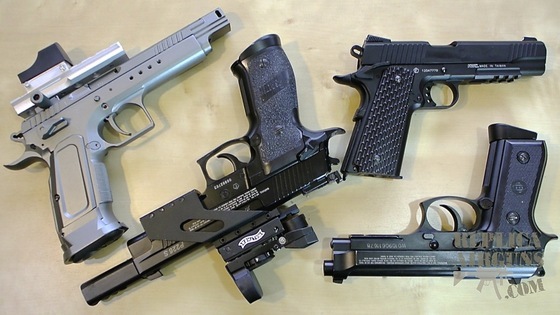 These super realistic BB guns also have full blowback with working slide catches, safeties and magazine releases and they can both be field stripped juts like the real steel versions. In this field test comparison I shoot both guns through my Chronograph to see what kind of feet per second performance each one shoots, I also take them back 30 feet and shoot 10 rounds on a paper target using a semi rested position for true accuracy results.